With Mr. H. and baby H. out of the house for the weekend, I have moved into the staying in bed, eating ice cream and watching television (possibly knitting) phase. As such, I thought I'd tackle a few more movies on my Iconic 80s list. 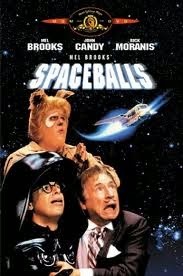 First up, Spaceballs. This is one of those movies I have seen bits and pieces of but never all the way through. I am a huge Star Wars fan, so you would think I would have seen this already. I've seen many Mel Brooks movies but my favorite is Young Frankenstein. I can watch that movie over and over again. I'm pretty sure I won't want to watch this again anytime soon. But it was funny. The first actual laugh I had was when the Jawa type guys find the princess et al and are signing/humming/something the tune to the Bridge Over the River Kwai march. There were several movie references, and one of them was Rambo, one of the other movies on my list. It's like the movie gods are guiding me. 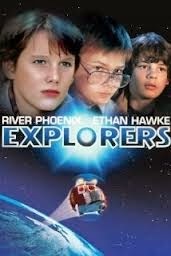 Next up, The Explorers. I noticed that the special effects were done by Industrial Light and Magic. So in a weird way, The Explorers is related to Spaceballs and it made dumb sort of sense that I chose this movie next (movie gods again). I do miss me some River Phoenix. He's such a cute nerd in this film. And just the other day I watched Sinister with Ethan Hawke - he was cuter back in the 80s - so again, connections and what not. This seems like a film I would have seen when it came out as I was 13. And Mr. H. was pretty surprised I hadn't seen it. However, it was also 1985, and that's the same year Back to the Future came out, so I was full on into my Michael J. Fox phase. The movie itself was cute, but the plot was very simplistic - boys build space craft, boys meet aliens, boys go home - that works on 13 year olds, not much 42 year olds. I did drag myself out of bed to do my Saturday morning long run. So just if you're wondering, I'm didn't actually spend the entire weekend in bed. 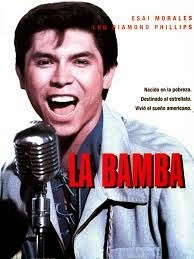 However, after I got home, I pretty much crawled back into bed and chose my next movie: La Bamba. Again, this is one of those movies I am kinda amazed I hadn't yet seen. Lou Diamond and I share the same birthday (though he's a few years older than me), and he's pretty easy on the eyes, but I guess that wasn't enough when this first came out to get me to see it. Whenever I watch any sort of biopic, I start googling to see what the "real" story is. The movie kept pretty close to the truth. It's amazing how quickly he rose to fame and realizing he was just 17 when he died (and Buddy Holly was just 22) is sad. Of course, I cried at the end. After La Bamba, I took a break for to watch the Germany/Ghana World Cup match. It's rough going on a movie bender. You want to keep watching films, but at the same time, it has to be the right kind of film. Something entertaining. Something that hits you right depending on the mood you're in. I've had a crappy week, so my preference right now is for light-hearted, funny movies. I've gone through Netflix and Amazon to see what movies on my list are available for streaming. Quite a few and so far I haven't paid any money to watch them. I promised baby H. that I would watch the Muppets Take Manhattan and the Secret of Nimh with him, so I'm running out of free options. It leaves me with Another 48 Hours, Raging Bull, Hoosiers and Drugstore Cowboy. Sure, Another 48 Hours is supposed to be funny, but of course, I go with the uplifting Drugstore Cowboy. It's probably one of the better movies on the list, but Gus Van Sant or at least his movies are so fricking weird and I've never really liked Kelly Lynch. I'm not sure why I don't like her. Just something. Anyway, it was good; Dillon really is a good actor. However, like the other movies on the list, I probably won't ever watch this again. But now I can cross it off the list. So as I mentioned, I did actually do one productive thing this weekend, I did my long run. It was a hectic week what with traveling back and forth to Paris and then sitting on my bum all weekend watching movies. So I missed a couple of my short runs, but I got back on the horse for my 7 mile long run. Again, I am really enjoying running with the CARA group. It's great to talk to people and I'm liking the 11 min pace. I wasn't liking the crazy humid air, but it's Chicago, so not much you can do but just get used to it.